to 5:00PM EST excluding holidays. Voice mail is available after business hours. Serial Number available when contacting our Service or Parts Department. 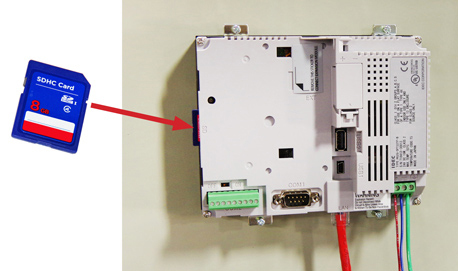 Model and Serial Numbers can be found on the white label on the outside of the electrical enclosure door of the unit. COULD RESULT IN DAMAGE TO THE UNIT AND VOIDED WARRANTY. When starting-up an air-cooled chiller, any removed "Access Panels"
causing a high pressure trip. All models are supplied with an 8gb SD Card for Chiller Data Storage. Daily chiller activity is stored on the card when the chiller is running. You can pop the card out of the side slot of the HMI, plug into an SD card reader, download and view the chiller data (HG Data) on your computer.